Dalzie apartment is in the wing of a former manse built in 1809. It was upgraded with the idea of making any guest feel exceptionally comfortable. There are all the modern accessories you might expect to be self contained. Fully integrated kitchen which is open plan to the living room with comfortable room for dining. There is even a piano along one of the walls! There is plenty of parking and you are in a great location to be able to explore all the Island has to offer. The bathroom is considerable in size, with separate shower and bath, room enough to relax. We regularly get feedback that people sleep in the bed as well or if not better than their own beds! The manse it's self has a walled garden with a little "burn" (stream) in it and there is a feeling of tranquility about. Come and sample it, we would love you to have a delightful visit to Skye and Dalzie will certainly help with that. We loved our stay at Peinore House. Lovely apartment with everything we needed. 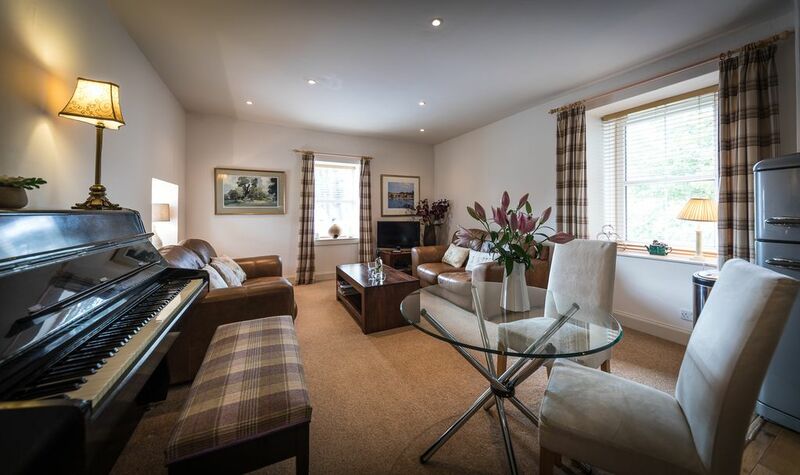 Close to center of Portree but nice to have quiet location. Ben kept us informed and was there if we needed anything. Highly recommend and would definitely stay there again. Enjoyable stay. Very quiet and peaceful. Very friendly owner. Very enjoyable stay in a very quiet and peaceful area. The apartment is spacious.The owner is really friendly and accommodating. It’s a shame that the advert showed the apartment had 2 bedrooms instead of 1 but I understand this has now been updated on the webpage. Thanks for the review. It means a lot that you enjoyed the stay. Once again, apologies for the typing error, you are correct this has all been changed to state 1 room. You are welcome back anytime!